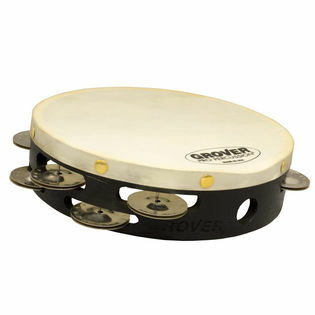 The Grover Pro Percussion T2/GS-8 8" Double Row Tambourine features German Silver tambourine jingles, double mounted premium white skin head, captive pin system, staggered jingle slot configuration, solid hardwood shell, and reduced width grip. A free tambourine bag is also included. Very fine quality. I love this tambourine! My suggestion is that it is too bad that not many companies produce or market more in this size. It was very difficult to find. This Grover, (double row) has a beautiful sound and I highly recommended this one for beginner/professional musicians. Steve Weiss Music demonstrates excellent classic quality in both sizes. Thank you so much!